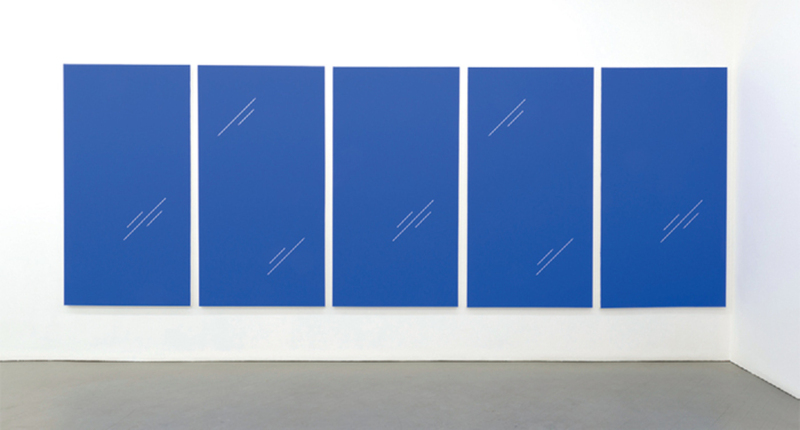 Paul Cowan, five works from the series “BCEAUSE THE SKY IS BULE,” 2013–, chroma-key blue paint on canvas, each panel 78 x 41". In 1999, the writer of a letter published in the British magazine New Scientist claimed that reorganizing the letters in the middle of a word has little effect on its legibility, as long as the first and last letters are in the correct position. “The resaon for this,” the author suggested, “is suerly that idnetiyfing coentnt by paarllel prseocsing speeds up regnicoiton.” In his first solo outing at Shane Campbell Gallery, Paul Cowan brought this (incorrect) thesis and its textual demonstration to bear in the visual realm.